We are a group dedicated to the fabulous canon pairing of Inu-Yasha and Higurashi Kagome from the anime/manga Inu-Yasha. Please join! 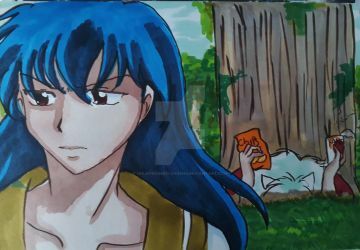 Tags: inuyasha, inu yasha, inukag, inuxkag, iy, rumiko takahashi, etc. I am so sorry! It seems that none of us judges are here on the same day...which is bad! I really wish we could tell you who won, but all you co founders need to tell me what you think!!! It was a hot summer day in the village. 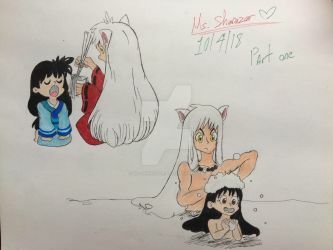 Months passed ever since the certain young priestess, Kagome was pregnant with the half-demon, Inuyasha's child. 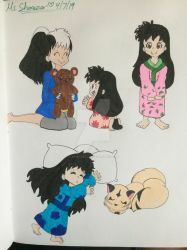 With the breeze gently through the window, Kagome and Inuyasha were laying together on their futon as he was laying next to her resting his head with his arm. His golden eyes stare down to his wife's swollen abdomen as she was rubbing it tenderly with her one hand. Her white yukata rode was open only let her bulged stomach shown while letting ample breasts half exposed. Since it was humid outside and it was becoming unbearable for her as she was sweat from her forehead to eyebrows. Luckily she was not wearing anything else aside her white modern underwear. We will accept any and all affiliates from any fandom, especially groups supporting Inu-Yasha. Welcome to InuYasha x Kagome FanClub! 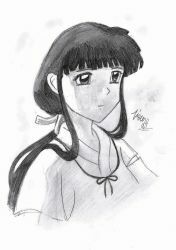 We are fans of the Inu Yasha pairing of InuYasha and Higurashi Kagome. Note which folder you’re placing your work into. Please make sure that your artwork has a watermark of some sort. Please note which category you’re placing your artwork in. Also make sure that you credit Rumiko Takahashi for her characters. If your work is in another language, please make an English version. ~ Summary A quick plot summary of about two sentences. Giving readers a taste. Uh, I read in the rules that you accept adult art, but I noticed that three works of mine are still waiting for approval. I also noticed there's not a file for Inukag, specifically, save the Features. Is a character design allowed for submission? I have an idea for a tiger demon half breed.